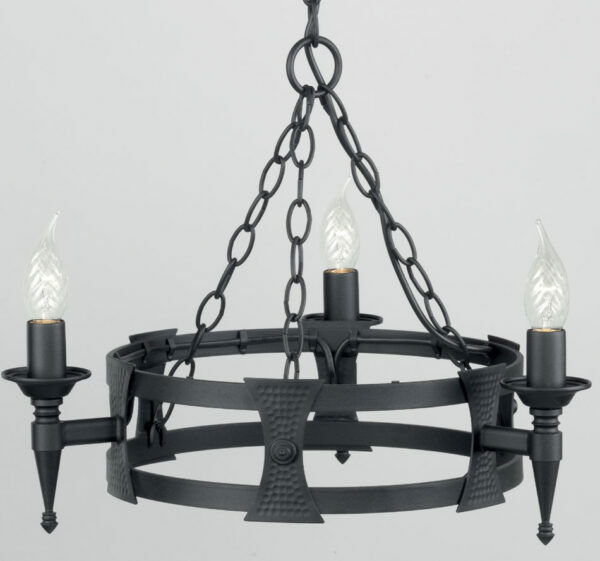 This Elstead Saxon matt black wrought iron 3 light cartwheel chandelier has two metal bands for the cartwheel rim, with hand crafted beaten shields decorating the outer rim. Each of the three torchière light arms are mounted on a shield and feature tapered finials and forged metal candle pans. It is all suspended from three chains attached to a central chain hanging from a circular ceiling mount. The Saxon lighting suite is a solid wrought iron creation that is built to last, with its core style designed around the shield plates. Historically all shields had a distinctive iron boss that sat centrally within the shield and offered protection to the hand and wrist. Each of the separating shield plates within the cartwheel feature a central ‘Boss’. The Saxon lighting suite has incorporated historical design and utilized it to create an exceptional forged iron range, which not only sets the scene within traditional and rustic settings, but also creates a dramatic statement when used within a modern room-set, combing the old look with new. This is a substantial handmade three-light chandelier, with a diameter of 520mm. Height adjustable at the time of installation, maximum drop 960mm. This heraldic ceiling light is designed and manufactured in England by Elstead Lighting, a British company that specialise in the manufacture and distribution of quality decorative lighting such as the Saxon matt black wrought iron 3 light cartwheel chandelier you see here.